Datphyutaung Buddha image is situated half a mile away from the palace site and stands on the hill which is 100 feet high. The original pagoda was erected by king Min Bar in AD 1530. That pagoda was named Datphyutaung because the white-bone relic of Buddha was enshrined. In the past, it was a stone pagoda, but it had already collapsed. Nowadays, the townspeople, therefore, erected the stone Buddha image on the lotus throne. 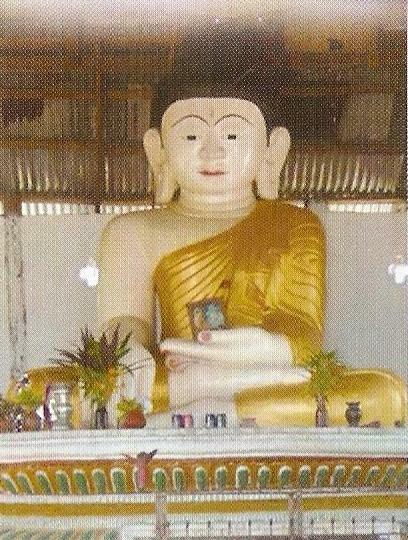 The Buddha image is 8 feet high. The contemporary donors made the figures in the form of preaching Dhamacakka sermon and other figures on the mountain. The townspeople donated the prayer hall for the image and the pagoda board of trustee maintains the image.